The human liver is a somewhat triangular-shaped organ that is located mainly in the upper right part of the abdomen, just under the base of the right lung separated by the muscular diaphragm. It is difficult to completely classify the liver under a specific system due to it versatility. Although it is largely associated with the digestive system, the liver has a wide range of functions and influences several other systems including the cardiovascular, endocrine and renal systems, among others. The adult liver weighs about 1.6 kg (about 3.5 lbs) and extends from the right upper quadrant (RUQ) of the abdomen to protrude into the the left upper quadrant (LUQ). It has four lobes – two anatomical and two accessory – and houses the gallbladder on its visceral surface. The liver is made up of smaller functional units known as the lobules which number anywhere between 50,000 to 100,000. Each lobule is made up of an arrangement of liver cells (hepatocytes) separated by channels known as sinusoids. Hepatomegaly is the medical term for an enlarged liver. A variation of this term known as hepatosplenomegaly means an enlargement of both the liver and spleen. If the spleen is enlarged on its own, then it is known as splenomegaly. The possible causes for both hepatomegaly and hepatosplenomegaly may be largely the same but it is best to consider each feature on its own. Hepatomegaly is a clinical sign of some underlying disease – it is not a disease on its own. When hepatomegaly is detected, it is essential to verify the cause of the enlargement as some of these causes can be life-threatening in a short space of time. Most of the liver is tucked under the bottom part of the ribcage. There may be a slight variation in anatomical position when standing up (erect) or lying down (supine/prone) as well as during breathing. Hepatomegaly is suspected when the lower border of the liver, which is palpable in young children and thin adults, is displaced. Sometimes this displacement is due to a lung disorder that pushes the liver downwards or surrounding masses as discussed below. Lung disorders can be excluded with percussion as the lung is more resonant compared to the dullness of the liver. The normal liver span is about 6 to 12 centimeters (cm). Palpation of the liver border across the abdomen is often not possible along the entire length of the liver in adults. The video below describes a typical liver examination that may be conducted by a doctor. Diagnostic imaging techniques like an ultrasound will confirm the enlargement of the liver. Lung diseases – chronic obstructive pulmonary disease (COPD) and asthma. Liver displacement may also be detected in very thin people. A patient’s lifestyle may also be relevant in identifying those who are risk. Recent travel to certain regions of the world, intravenous drug use, alcohol misuse and sexual behavior may be helpful in identifying high risk patients for various liver diseases. Alcoholic liver disease (ALD) is damage to liver tissue induced by alcohol and may be reversible or irreversible. 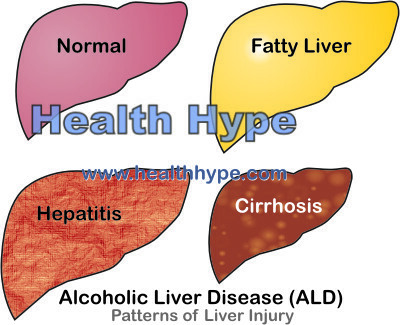 There are different patterns of liver injury as illustrated below that may lead to changes in the liver size. However, cirrhosis is irreversible and will gradually progress to liver failure. Non-alcoholic fatty liver disease , or simply just fatty liver disease, is an accumulation of fat in the liver cells (hepatocytes) that occurs in a person who does not consume alcohol or drinks minimal quantities. There are two main forms – simple hepatic steatosis where there is no liver inflammation or non-alcoholic steatohepatitis where there is concurrent liver inflammation. Hepatitis is inflammation of the liver most commonly caused by a viral infection (viral hepatitis). The most common forms are hepatitis A, hepatitis B and hepatitis C. There are different types of hepatitis which is associated with various causes, including non-infectious factors. Autoimmune hepatitis is another type of hepatitis that often causes liver enlargement. Benign and malignant tumors may arise in the liver and can cause hepatomegaly. Tumors such as hemangiomas and adenomas are benign (non-cancerous) and may responsible for liver enlargement. The concern, however, is more often about malignant tumors (cancer). It may arise in the liver itself (primary hepatocellular carcinoma) or spread from other sites to the liver (secondary metastatic cancer). Right-sided heart failure or right ventricular failure occurs when the right ventricle does not pump out blood properly. There is congestion in the venous system returning blood to the right side of the heart and fluid may leak out of the veins and accumulate in the tissue spaces. Primary biliary cirrhosis is the inflammation and damage of the bile ducts which prevents bile from draining out of the liver. It eventually leads to liver damage (cirrhosis). The following conditions are either uncommon or infrequently cause hepatomegaly. However, it should be investigated if the more common causes have been excluded.